Pensacola is a city located on Pensacola Bay and Escambia Bay in the western Florida Panhandle. As of the 2010 census, the city had a population of approximately 52,000 people, but the Pensacola Metropolitan Area contained 461,000. Pensacola is well known as the home of Naval aviation, as the area contains the first U.S. Naval Air Station, the National Naval Aviation Museum and the Blue Angels, jets that fly in formation at air shows. Five flags have flown over the city, those of Spain (Castille), France, Great Britain, United States of America and Confederate States of America. U-Surge provides high water marks from 56 hurricanes and tropical storms at Pensacola since 1900. Hurricane Frederic (1979) generated the highest storm tide on record, as the water level reached 12.30 ft above the Annually-Adjusted MSL (AAMSL), Hurricane Ivan (2004) generated a storm tide of 11.71 ft above AAMSL and sea-level rise enabled Ivan's water level to reach within 2 inches of Frederic's. An unnamed hurricane in 1906 generated a storm tide more than 10 ft above AAMSL. These three hurricanes generated water levels substantially higher than the other events on record and they all occurred in the month of September. This histogram provides the maximum water levels of the 56 recorded storm tide events at Pensacola since 1900. The events are ordered from the highest water level (Rank = 1) to lowest (Rank = 56). These events are not placed in chronological order. All data are detrended to remove the influence of relative sea level rise, so they represent water levels above an Annually-Adjusted Mean Sea Level (AAMSL). This time series provides maximum water levels from 56 recorded storm tide events at Pensacola since 1900. These events are ordered chronologically from oldest (left) to newest (right). The numerous low-magnitude events in recent decades are influenced by both climate and data availability. All data are converted to NAVD88 datum, however, the data are intentionally not detrended, so the influence of relative sea level rise is included. SLR trend taken from NOAA tide gauge at Pensacola. 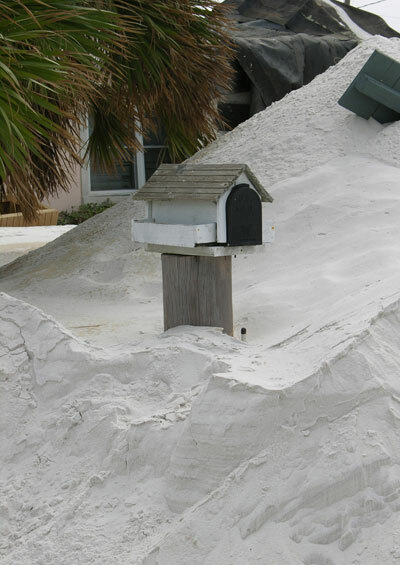 The U-Surge Project has calculated extreme water levels for Pensacola, including the heights of the 500, 200, 100, 50, 25 and 10-year storm surge levels. These data-driven water levels are typically higher than FEMA's model-driven data, with the 100-year water level ranging from 2-4 ft higher than FEMA's 100-year level for most cities. Extreme water level analysis is available upon request. Email: hal@marineweatherandclimate.com. The U-Surge Project has documented historic sea level rise and various sea level rise projections for Pensacola. Sea Level Rise projections are added to extreme water levels (section above) to enable users to estimate future extremes in a changing climate. Sea level rise and future extreme water levels are available upon request. Email: hal@marineweatherandclimate.com. Pensacola's 56 high water marks come from a small geographic area near the city's waterfront. This tightly-clustered area provides a highly homogenous dataset that come from the same sample population. The data come from within a 2-mile data-selection circle centered on the coordinates: Lat: 30.4078 N, Lon: -87.2153 W.
At 1:52 into video, Mike throws open the door on the 4th story of a parking deck and shines a beam into the teeth of Hurricane Ivan. He focuses beam on a storm surge pounding on a palm tree. Top 3 storm surge video in recorded history, in my opinion!